""The Amazing Adenium Bonsai Seedlings"
I have shared the techniques of how to produce colorful Adenium flowers many times, today I would like to change and share the idea of growing Adenium with Bonsai’s technique to make your Adenium more beautiful and attractive. 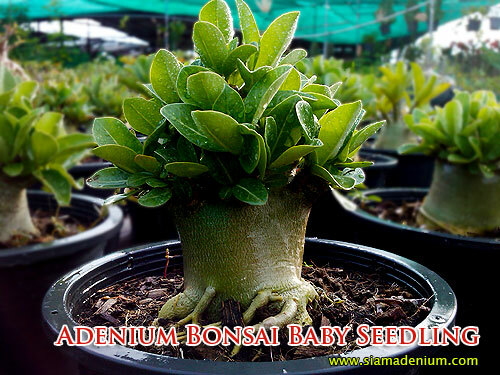 The Adenium’s decoration following with bonsai guide arises from the cultural adenium’ growers to develop and build new trend to the field of adeniums including with the value added to Adenium itself. This is also to attract people to the beauty of their fascination. This beauty would come from natural Adenium’s modification to new form created by imaginative works of art and thought of Bonsai basis. Then transfer to elaborate root branches form on the basis of elements not conflict with too much from the balance of nature. decoration is must come from the imagination and emotion including the idea of each person that cannot be taught. 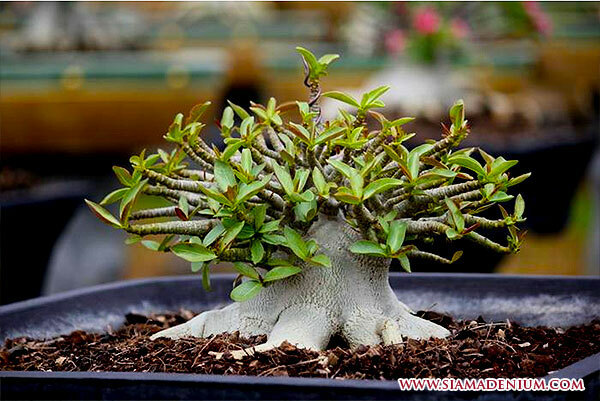 The most attractiveness of Adenium as Bonsai form is the “ROOT” and also this is the hardest part to do. 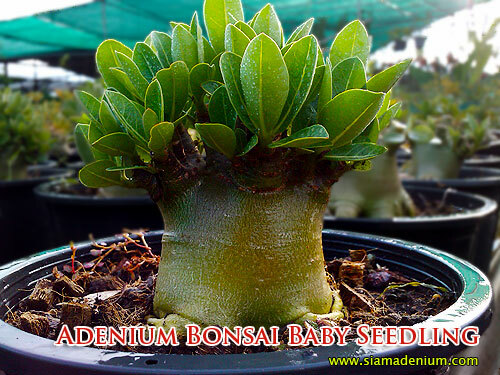 You can also add more value to Adenium with nice root arrangement. One more important thing is to protect rotten root cause of banding together and broke away. Normally we need to repot or remove adenium to grow in a new container or pot every 6 months so we can use this opportunity to arrange the roots at the same time. Here below is the technique of root arrangement. 1. 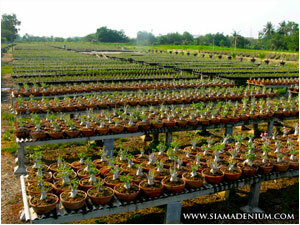 Remove Adenium from old container very carefully then spray water all over it to remove soil. 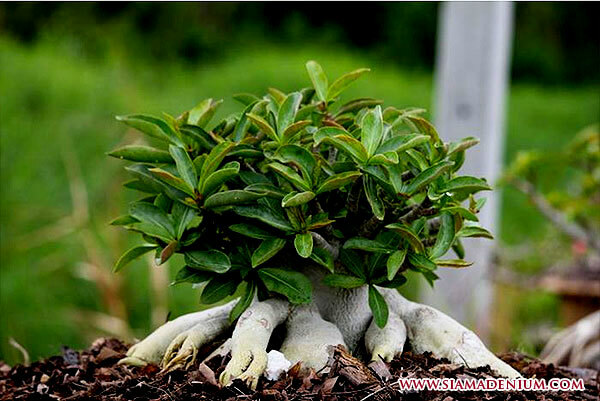 You need to do very gently on the fibrous roots because they are very sensitive. 2. Make it dry by hanging in the shade about one week so you can repair the tie roots easier. You don’t need to finish this by one time. If you feel roots tie very hard, you can dry it one more week then you can notice roots will get more loose and easier to do again. 3. Make root more spread as much as you can. You can use the chopstick or toothpick to fibrous roots to order them. For the bigger ones, you can use foam cut as triangle or cubic shape depending on room between each root’s positions. You can also cut the unnecessary roots or wrong roots’ positions with clean and sharp razor. 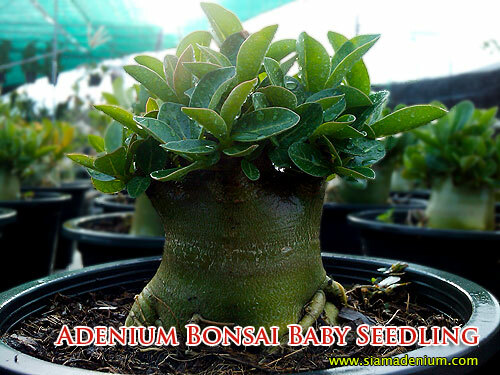 After that, spray your Adenium all over with fungicide chemical to protect rotten roots after repotting. Then hanging it one more day and make sure it dry. 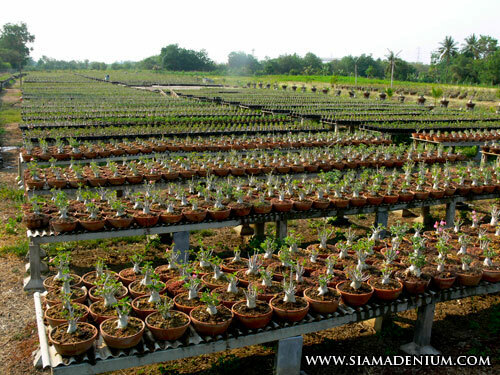 Now it’s time to grow it with new container or pot. Media Preparation – We separate the media in 2 parts. The first one is rough media using for normal growing and the second one is powdering media using for surface’s decoration to roots. Put the coconut chunk about ¼ of container or pot height then put the rough media until ½ of container height. Make the media like mountain higher than container border around 2-3 inches. 4. 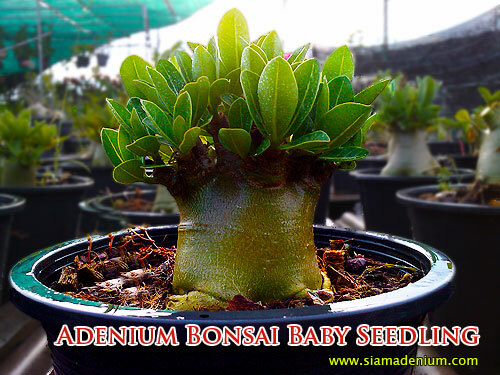 Put the Adenium carefully on it at the center of container and arrange root to spread with order from top of mountain straight to container’s border as much as you can. 5. Use the powering media to cover all the roots very gently. 6. Water your Adenium with fungicide chemical from top to all media and make sure this solution flow out of container bottom. Now your Adenium and new media are free of disease. Now your Adenium leaves might become yellow and fall. Don’t worry; this can happen with changing adenium with new media changing because Adenium is not get used to with it. Then put your Adenium in the shade until you see new small leaves coming up. Now you can take her to outdoor to get full sunlight. You should use the cotton bag to cover the media again to protect burning on fibrous roots. 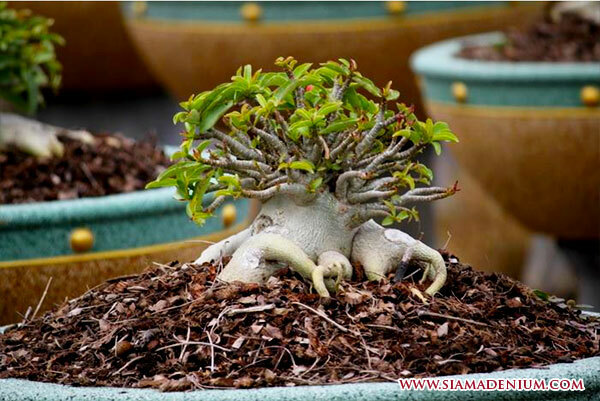 Of course, fibrous roots can make your adenium more attractive when they are getting bigger. 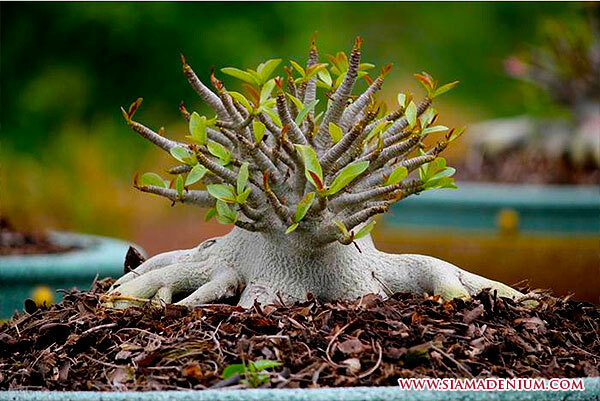 This is just general idea about Adenium root’s arrangement. There are many things beyond this and I am pretty sure you will have fun with it. Take care and have a nice day.